A little over a week ago I was able to attend Creative Assembly’s studios in Horsham. This event is a showing of Total War: Three Kingdoms – a game I’ve been waiting for well over a decade. During the event, I was shown and able to play the same content that will be made available at Gamescom. This 430-mile round trip was always going to be worth it, if only for two reasons. First, I’m a massive fan of Total War. A series veteran, by all accounts. I’ve played every single title of the series. It was Rome: Total War that led me to first build a gaming PC. The second reason is my love of Three Kingdoms, having read both the Romance of the Three Kingdoms Novel and Records of the Three Kingdoms book. I’ve also played a multitude of titles that cover the period and also watched the shows & films. It’s slightly possible I could be going into this with higher expectations than normal. Of course, at this early stage, I haven’t seen remotely close to everything that the game has to offer. It won’t even be released until Spring 2019 (20th March – 21st June). During the event, I was able to see a video, showing a flyover of the campaign map. In addition to this, I was able to play a battle – the ambush of Sun Ren (Sun Shang Xiang in the Dynasty Warriors titles). I was also able to interview Attila Mohacsi, the Senior Game Designer and Al Bickham, Development Communications Manager. You can read the interview here. One thing that was immediately noticeable from the flyover of the map is just how large it is, but also the variety and emphasis on terrain. The south of China, particularly the Jiangdong area (modern-day Jiangnan), has an abundance of water but also a significant amount of rugged, mountainous, terrain. The north of China, particularly the provinces of Ji and Qing. More than that, a lot of focus has been put on the limited water you encounter. The Yangtze and Yellow Rivers, for example, are huge and have visible trade and shipping lines along them. Major roads show a great deal of traffic moving between cities. The map, the world, just feels like things are happening and the world is running around you. Likely, that’s because it is. For the first time in the series, the game has a day-night cycle linked to the passing of time. I think that really strikes the most about the map of China is just how vibrant it looks. The video, featuring a brief flyover of the map, takes place during a campaign in progress and is meant to be reflective of what you’ll see when you play the game. It’s a large difference to the campaign maps you’ve seen in any other game from the series. The lush green of the forests, the cloudy colour of the Yellow River – named as a result of the colour at the lower reaches of the river, caused by the soil picked up by the water. The deep blues of the Yangtze. Even the signs of battle, from towns and cities under siege. Then the shadows and reflections caused by the game’s day-night cycle. It all looks that much more alive, with the colours just adding to the effect. That flyover leads right into the battle that I got to play. First thing I should point out is that this takes place in Romance mode. For those unaware, Total War: Three Kingdoms has two modes: Romance and Classic. Romance allows for some of the more character defining moments of the Three Kingdoms and places a huge emphasis on the people. 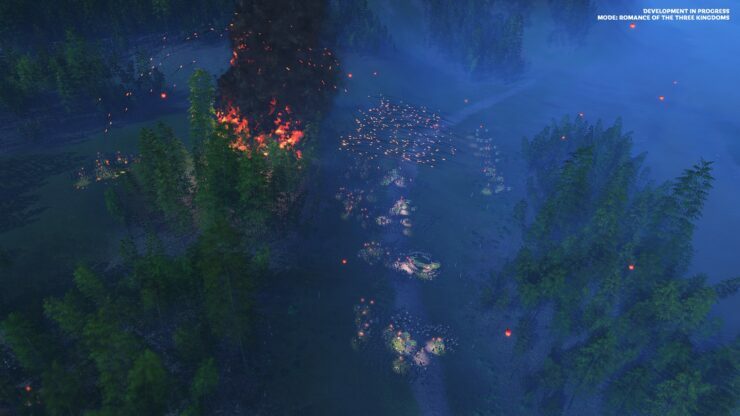 Classic is the Total War game mode that everybody is used to. So, Romance mode. It’s certainly a change from the norm but something I’m excited about. For a long time, generals in the series have had abilities to bolster or rally your units. Until now (not including special units in the Warhammer series of Total War games), they haven’t been able to single-handedly target enemies with a special ability and turn the tide of a battle. Even more interesting is the fact that they’ve never had the ability to duel an enemy character before now. It’s in this that you get to see people that were, literally, larger than life. In the battle I played, Sun Ren and Sun Quan are ambushed by an army sent by Cao Cao. Jia Xu leads the initial forces. He is then backed up by another force led by both Zhang Liao and Xu Huang, both fearsome and strong generals in their own right. Characters have a class that identifies their strengths and weaknesses, also showing roughly what their abilities may be. In the case of Jia Xu, he’s a strategist – as he was. Weak in battle but with tactical abilities that can boost troops in many ways. Sun Ren, on the other hand, is from the Vanguard class. While she isn’t the most powerful by any shadow of a doubt, being weaker than both Zhang Liao and Xu Huang, she has abilities that can significantly damage enemy forces and characters. Indeed, this was my way of winning the battle, even on hard mode. Sadly I didn’t capture the battle myself so I will only be showing the provided B-Roll. But what happened is I was able to use Sun Ren’s abilities to damage enemy characters, while Sun Quan used his abilities to bolster my forces and hold the enemy forces at bay. Once I had damaged the characters enough I used the new duel feature to challenge these warriors. They accepted but since they were already weakened, I was able to defeat them. This quite literally demolished the morale of the enemy. One thing players of the series may have noted is that I had two generals within the battle. No longer does an army consist of a general leading however many units you attach to them. These characters that consist of your army have their own retinue of units, some of these that can be quite specific to the character. Some units, mercenaries, under Sun Ren had a brand new ability that allowed the front two rows to defend with spears while the rear rows fired missile weapons. One unit performing two actions simultaneously, not seen before in the series. Other things not seen in the series prior to Three Kingdoms is the second method to end, not necessarily win, an ambush. In addition to this, there are features on the battlefield itself. In this case, it was the Chinese Lanterns. Smaller, localised elements and effects can drastically impact the battlefield. 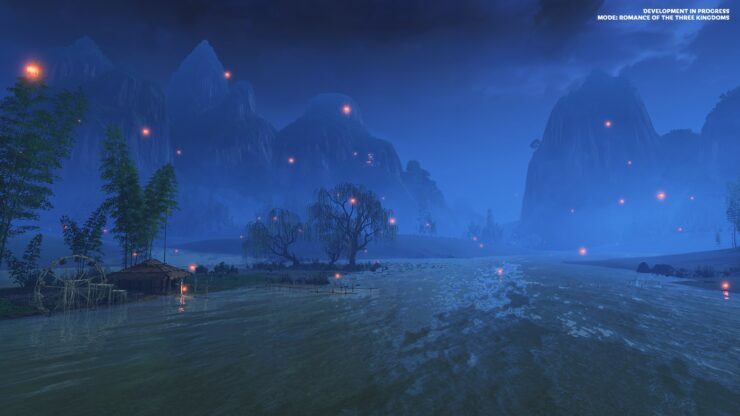 The Chinese Lanterns, for example, can light up areas of the battlefield and remove the cover. As for finishing the ambush, to win you could either defeat the enemy or reach a designated escape point. Reaching this escape point can see you keeping characters alive but with the huge loss of their retinue. Maybe you’ll achieve a victory of sorts, escaping with the majority of your units. Only time will tell. 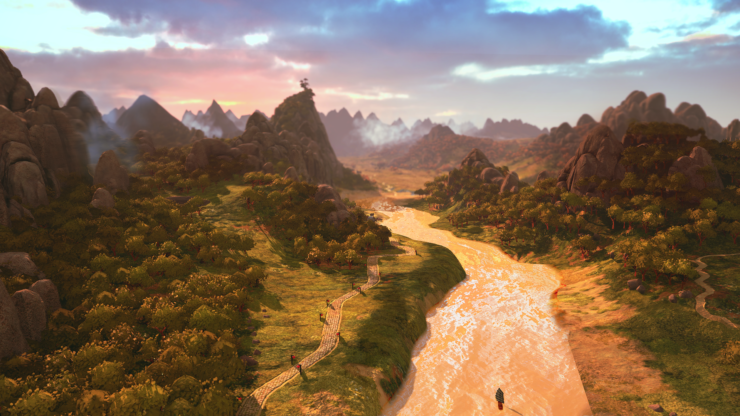 Did I enjoy my time with Three Kingdoms: Total War? Having played through the battle four times – losing once and winning three times – I did. There’s a fresh feel to the game without drifting off into Warhammer territory. It’s grounded, at least to a degree, in reality. Ignoring the story elements, there’s a number of new features placed into battles to be seen even from this one alone. It also looks fantastic, with the aesthetic choices and increased colour found in the game. Looking at the story. I know for a fact that I’ll be playing in Romance Mode when I play the game in full. I’ll either be using Liu Bei and focus on Guan Yu & Ma Chao or use Cao Cao and be focusing on Xiahou Dun. But this is what excites me the most about Three Kingdoms: Total War – there are some fantastic stories in real life to draw from, as well as the fantastical tales from the Romance of the Three Kingdoms novel. One is a person still honoured as a god. I’ll never hide the fact that I’m going into Total War: Three Kingdoms hoping that it meets any and all expectations. This can be a burden on any game – ask Final Fantasy XIII, the game that metaphorically stabbed me in the heart. Still, I came away from this Three Kingdoms preview more excited than when I went in, that’s as good as a sign as I can ever give. Now I just have to wait another six months or so.